RICHMOND, Va. — L. Douglas Wilder, a grandson of slaves, became America’s first elected black governor 30 years ago, winning in Virginia in part by finessing the racist history of the state that is now roiling its politics once more. To succeed as a black candidate in 1989, Mr. Wilder had to patiently accommodate the one-time segregationist Democrats and the state’s Lost Cause Confederate heritage. He had to win over some of the foes who had defeated his attempt to establish a state holiday honoring the Rev. Dr. Martin Luther King Jr. He had to appear in proximity to the Confederate monuments that dot courthouse lawns and Civil War battlefields across Virginia without raising a whisper. The revelations of not-so-long-ago racist behavior by top leaders, which turned the Capitol into a veritable soundstage for a mind-bending political thriller over the last week, are testing the state’s image as a progressive-minded, New South beacon that backed Barack Obama and Hillary Clinton for president. With the political crisis showing few signs of abating — Virginia’s Democratic congressional delegation renewed calls Thursday night for Mr. Northam to resign — the major question is how willing Virginia’s leaders and voters are to punish the transgressions of a younger Mr. Northam and Mr. Herring for behavior from a less-enlightened era before Mr. Wilder’s election. “We’re going to have to have a greater understanding all-around of what Virginia was like, and I’m not sure today’s standards should go back 30 to 40 years ago, when people were in college,” said Jerry Kilgore, a former state attorney general. In truth, the firestorm over blackface photos is only the latest example of Virginia suffering humiliations over racism that cause pain to its residents and tarnish its well-burnished reputation. The state’s ample self-regard has suffered blow after blow, in part because of its unwillingness to fully reckon with a past that, while not as violent toward its black citizens, was no less ugly than its Deep South brethren. In 2006, then-Senator George F. Allen, a Republican, stumbled into the national spotlight by pointing a finger at an Indian-American Democrat videotaping his campaign appearance and referring to the tracker as “macaca,” a slur for dark-skinned Africans. But the cascade of revelations here since the racist images from Mr. Northam’s yearbook surfaced last Friday has stung Virginians because the blackface imagery demonstrates how deeply embedded white supremacy is in the state’s not-too-distant past. Recounting Mr. Herring’s tearful confession Wednesday morning to the legislative black caucus that he had once worn blackface, a longtime state senator, L. Louise Lucas, choked up for a moment as she recalled the meeting’s emotions. Larry J. Sabato, a University of Virginia professor who has practiced and studied politics in Charlottesville since he arrived as a college student in the early 1970s, said this week should awaken the state. “This collection of scandals proves beyond a doubt that Virginia has not progressed as far as it thought it has — and it has a past it still hasn’t come to terms with,” said Mr. Sabato. Perhaps that is not a surprise for a state that is still littered with Confederate iconography — the new Amazon headquarters in Arlington will sit hard by Jefferson Davis Highway — and just last month celebrated Lee-Jackson Day, a state holiday. The state Capitol is filled with promotional materials trumpeting the 400th anniversary of the first representative assembly in the new world, which is what makes the General Assembly here the oldest continuous legislative body in America. But this year also marks two other milestones: the 400th anniversary of slaves being brought to Jamestown and the 60th anniversary of Prince Edward County closing its public schools to avoid integrating them. 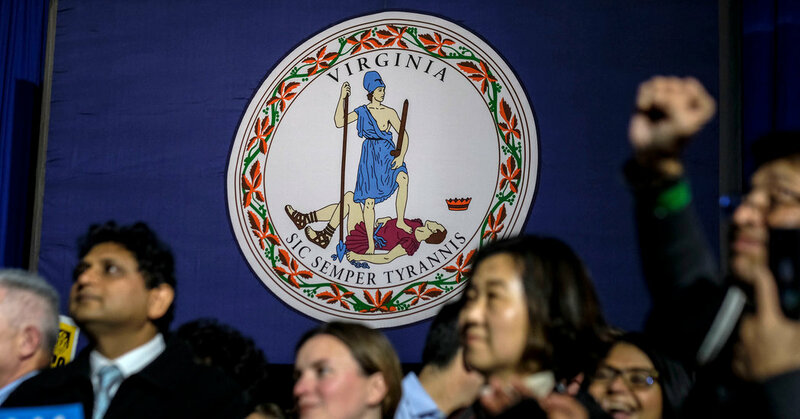 Yet to those who are eager to see Virginia move beyond its racist past, this past week’s tribulations have obscured the real progress the state has made in recent decades. It is hard to overstate how important race was to the segregationist Democratic machine, led by Senator Harry F. Byrd, that controlled Virginia politics for much of the 20th century. In his seminal 1949 book, “Southern Politics in State and Nation,” the scholar V.O. Key Jr. famously called Virginia “a political museum piece” for its efforts to keep blacks and poor whites off the voter rolls. In fact, the so-called “massive resistance” to integration, which had its origins here, is what extended the political life of the so-called Byrd Organization even as Virginia swelled in the years following World War II. But even well after the death of the Jim Crow era, Virginia politicians had little choice but to tread gingerly on matters of race. Few know that better than Mr. Wilder. In order to earn his party’s blessing to become lieutenant governor in 1985, Mr. Wilder had to win over one of his foes, the powerful state House speaker and an old Byrd disciple A.L. Philpott. That was three years after Mr. Philpott blocked Mr. Wilder’s attempt to enact a state holiday honoring Dr. King. Then, as a candidate for governor, Mr. Wilder campaigned aggressively across rural parts of the state, such as Mr. Philpott’s Southside, where the Confederacy was enshrined in history. Even now, the Jim Crow era of racist behavior like blackface is hardly an ancient epoch in Virginia. “If you’re 50 years old, when were you born? The ’60s, the ’70s. The state was just coming out of segregation. Your parents, everybody else, were part of it,” Mr. Goldman said. But Mr. Wilder’s election did not fully bind up the state’s wounds, and the decades since have been met with both advancements and setbacks. In 2006, Virginia Democrats pried the first of two Senate seats away from Republicans by nominating Jim Webb. Mr. Webb was a former Navy secretary in the Reagan administration who had written and spoken admiringly about the Confederacy’s martial valor. While attending the Shad Planking, the state’s most iconic political event and itself a vestige of the Byrd era, he gladly accepted a Confederate flag lapel sticker. Steve Jarding, a Democratic strategist who advised Mr. Webb and helped steer Senator Mark Warner to the governorship in 2001, said that at the turn of the century there had been stronger traces of explicit racism and Confederate nostalgia in Virginia politics, especially in rural areas. Still, images of blackface and Ku Klux Klan robes “would never have been O.K.,” as Mr. Goldman put it. Virginians are still coming to grips with this latest chapter in their state’s history, with Mr. Northam determined to try to salvage his reputation and keep his job and Mr. Herring doing the same but likely having lost his own hopes of becoming governor. Many state officials are in almost a state of shock, stunned that the ghosts they thought had been banished have returned. As she left the Capitol Wednesday beneath the etched-in-stone Jefferson quote — “The most sacred of the duties of a government to do equal and impartial justice to all its citizens” — Senate clerk Susan Clarke Schaar said she had never seen a day like it in her 45 years here.